Begar Shivkumar was born in the village of Begar, Karnataka in 1969. When he was a child he performed the role of Manmath in the play Rathi Kalyana staged in Begar. 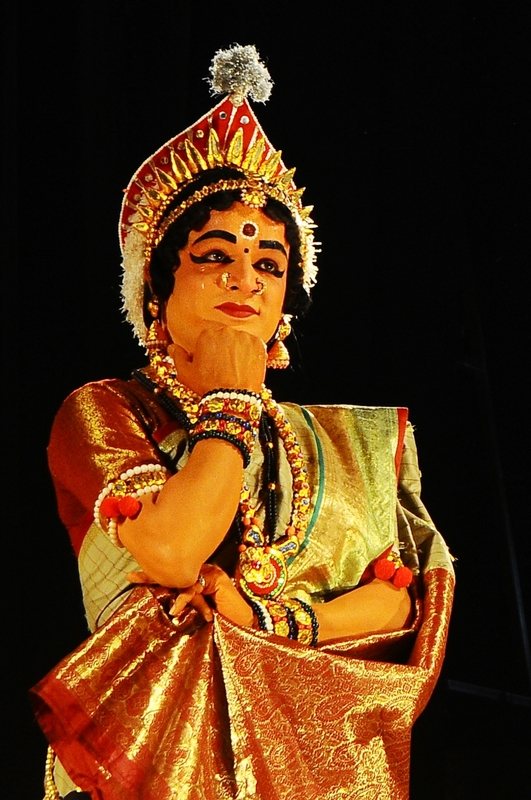 Greatly influenced by this performance, he joined the Yakshagana learning center in Udupi. Begar was one among the 10 students who got selected by Kota Shivarama Karantha at the Udupi Yakshagana center in 1982. He had then just completed his primary education. During the 10 months’ course, Shivkumar learned Yakshagana from Neelavara Ramakrishnaiah, Heranjalu Vemkataramana and Kota Mahabala Karantha. In the beginning he performed Balagopala dance and started his career with Mulki troupe. As he was a very young boy he found it difficult to adjust to the troupe environment. So he started working at a fruit stall. But after a few months, the passion for the art form persuaded him to join Kamalashile troupe and re-start his career. Soon after he joined the troupe, he played a female character. Though he was not interested in female roles, the appreciation he received from the audience encouraged him to continue as a female role artist for four years. Though there were senior artistes, people wanted to see only him in Devi roles. After that grand success of his first performance, he continued as a female role artiste. Though he was selected into Amrutheshwari and Saaligrama troupes, he joined and served with Soukuru troupe due to the sudden death of the famous singer Kaalinga Navada. Though he was trained in badaguthittu style of Yakshagana, he was invited to join Dharmasthala troupe which follows tenkuthittu Yakshagana. Slowly he picked up tenkuthittu form of Yakshagana too. After about two years he got a chance to act in the role of Kunti. Later he got opportunities to act in lead roles and served with Dharmasthala troupe for 12 years. Then he went to Bangalore and started a school called Gaana Sourabha Yakshagana School. Since then, for 13 years, he has been teaching Yakshagana. Begar teaches both tenku and badaguthittu yakshagana along with the musical instruments like chande and maddale. He also trains students in bhagavathike (singing). He is involved in bringing innovations in Yakshagaana. Begar has received Nadaprabhu Kempegowda award, Karavali Utsava award, Basavaratna award, Abhinandhane award, Yakshashree and Honorary doctorate for his service in Yakshagana. Manorama B. N.: What are the attributes an actor playing a female character should possess? Begar Shivkumar: An artist should be capable of doing deep study and have ample patience. Otherwise we won’t survive as an artist. Today artistes take their roles very lightly. Even though it may be a small role, when we perform it on stage, it means we are given a chance to prove our ability. So we should show respect towards both—the character and the stage. We should keenly observe the performances of other senior actors and learn and imbibe the good elements from them. In Yakshagana, dialogue delivery is different from that in other dance dramas. We should learn to deliver dialogues in different styles. Monotony in dialogue delivery will only result in boredom for the audience. When we perform we should try to create a feeling of happiness in the minds of the audience. They should feel closely connected with the character we are portraying as if she is one of their close relatives like a mother, sister or lover. M.B.N. : What about women playing a female role? B.S. : A female performer playing a female role would not face a problem. But normally, the practice in Yakshagana is that the female roles are performed by male artists and the audience are used to it. So they may not accept a female playing a female character in Yakshagana. Generally the women performers fail to give justice to the roles of their own gender. I have heard several artistes and even women expressing the same viewpoint. M.B.N. : Does real life present any contradictions to female role players? B.S. : A female role artist gains respect through professional behavior. I have not experienced any untoward incident in my life till now. If we act like woman in our real life, then it will look ridiculous to others. Behaviour and attitudes are important for a female role artist. There are numerous things to learn while acting. We should communicate the values of the characters we portray to the audience properly. It will create a sense of morality within ourselves also. M.B.N. : Are you satisfied with the performance of female role players? B.S. : The presentation of a female role has evolved over the years. Nowadays when a character makes its entry we see a lot of dance. It is really not necessary. Yakshagana doesn’t depend on an individual person. But nowadays the artistes are given more prominence than a character or the prasanga. An artist should not use the stage to boost his ego and self-esteem. He should perform within the limitations of the character he is portraying. M.B.N. : What should male artistes performing female roles do to sustain their career for more years? B.S. : As the female role player becomes older he should take good care of his health. He should keep himself away from bad habits. We should try to maintain our beauty as long as possible. Because the first thing people observe in a female character is her beauty. Though we may possess knowledge and technique, the audience won’t accept us without the visual appeal. So it might be better if a female role artiste retires early. Then probably he can try his hand in performing male characters or involve himself in teaching Yakshagana. One can play the characters of Mohini, Maya Shoorpanakhi or Menaka till one reaches 30 to 35 years of age. Afterwards one can’t be expected to play such roles. How can one play Mohini at the age of 50 or 60? M.B.N. : According to you what should a female role artiste keep in mind while performing? B.S. : Acting in a female role is very challenging. In the audience’s mind it is a female artiste who is portraying the female character and not a male performer. So we should act accordingly. We can continue to perform female roles until we are capable of expressing characteristics unique to women. A female character should lead the whole play with lots of patience like a woman leading her family. The female character is a very responsible character. Yakshagana stories without female characters are very boring. But what happens is that when a female role player gains popularity and success, he tends to throw attitude. If an artist allows his ego an upper hand, that is the end of both the character and the artiste. M.B.N. : What are the contributions of Yakshagana to society? B.S. : I feel happy because now Yakshagana artists are looked upon as models for society. They try to achieve something new from the old play texts, and give good messages to the people. Every character in Yakshagana sends a message to the society. Yakshagana teaches us to respect elders, women and society as well. Learning Yakshagana will help the children in their physical, mental and overall development. M.B.N. : Tell us about your Yakshagana school Gaana Sourabha Yakshagana Shaale? B.S. : Earlier it was really hard to get students for Yakshagana. Slowly more students have begun to enroll because society has become more encouraging and receptive. I want to set up a theater to stage Yakshagana shows. But the problem is to find adequate financial support. In our curriculum I have included public interest messages like environmental conservation, protecting our culture etc. M.B.N. : What do you think the government can do to support and publicize Yakshagana? B.S. : Professional artists should get a chance to act in a Yakshagana play sponsored by the government. The government should extend its support to Yakshagana artists and should release grants to Yakshagana schools. It should select artistes for awards on the base of seniority. If it could set up stages specially dedicated to Yakshagana even at district and Taluk levels, it would be great for promoting this ancient art form. Then only can we say 'Yakshaganam Vishwaganam’ (roughly translated as 'the song of Yaksha, or demi-god, is the song of the universe') in its true sense.